Many reports claim that his career at Old Trafford is gone after scoring just three goals in 23 games before the UEFA Champions League match against Valencia. After he was dropped in the defeat to West Ham, Jose Mourinho recalled Alexis Sanchez into the starting line-up on Tuesday night. 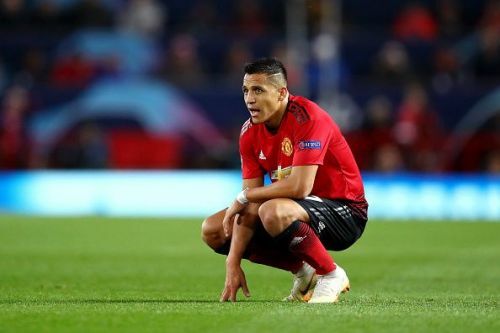 Even with all the pressure on him to perform well, and re-establish himself as a key player in the side, Sanchez has failed to have a positive impact on the game. The Red Devils were forced to settle with a goalless draw against Valencia at home. When the home club was on form, one would have expected them to overcome Valencia easily. The Spanish club are not doing well domestically either, as they sit 14th in the La Liga table after seven games. SInce the new season began, Valencia had not won a single match in the domestic match until the seventh game. They managed to overcome Real Sociedad 1-0 on Saturday. United has created history by earning just ten points in seven league games since the start of the season. This represents the poorest start the club has had since the 1989/1990 season. In yet another game, where Sanchez was clearly presented the chance to perform, he failed miserably. The 29-year-old simply couldn't find his way through Los Ches' defence. Overall, he and his team looked disjointed as Valencia kept the attackers quiet. When the former Arsenal forward was substituted halfway through the match, fans started to cheer. He has certainly lost the support of the home fans and they cannot wait for the highest paid player in the team to leave in the transfer window. With so much uncertainty surrounding the club and their players, no one knows whether the manager will be sacked, or some players would be sold first. Here was how Twitter reacted to Sanchez's performance. Big Arsène Wenger has done it again with Sanchez, hasn’t he? Shipped him out and now he’s finished. Gabriel Paulista pocketing Alexis and Lukaku while Coquelin playing Pogba off the park. Arsene Wenger, he’s done it again. Alexis Sanchez went from being one of the best players in the Premier League at Arsenal to becoming a piano player at Man Utd. The purchase & sale of Sanchez were equally some of the great Wenger moments. Alexis Sanchez goes off, and by lord, that might be one of the worst performances I’ve seen from a professional footballer in quite a long time. Does Alexis Sanchez have some kind of incomplete pass bonus I’m unaware of? Sanchez on a free was the biggest scam of 2018. The curse of the number 7 continues with Alexis Sanchez unfortunately. Another Sanchez Disasterclass, should just retire now, Finished player.